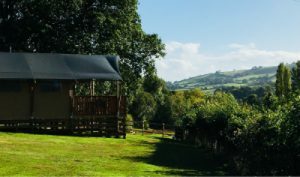 Situated in our top paddock overlooking the beautiful Exe Valley we have three fully-equipped luxury safari tents – Oak, Maple and Birch. 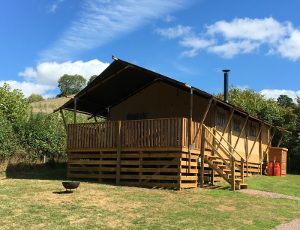 Each tent has hot running water, electricity and Wi-Fi connectivity. 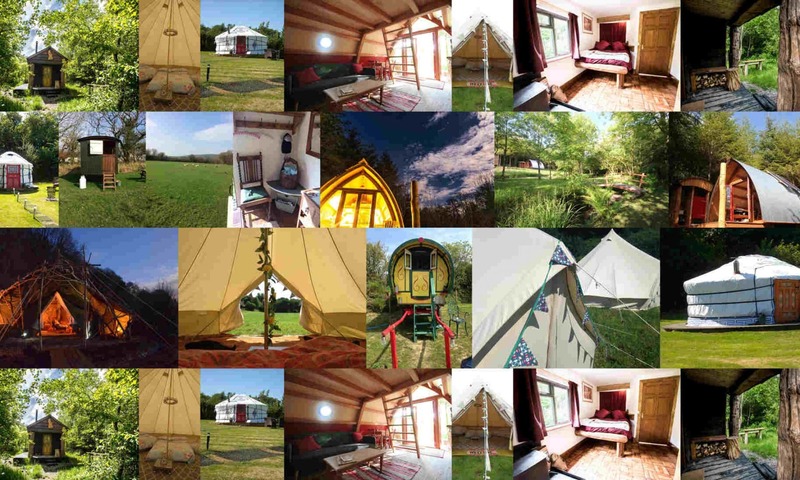 They sleep up to six with two bedrooms – one king, one twin plus a cabin bed which accommodates two children or adults! 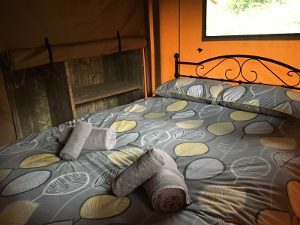 Each tent has a bathroom at the rear containing a shower, toilet and sink. 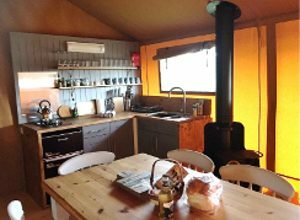 There is also a fully equipped kitchen with fridge freezer, gas hob and wood burning stove so you can get cosy as night time falls. Next to this is a lounge area to play games, read a book or just chill out. Outside there is a BBQ area for creating some culinary delights and for the traditional custom of marshmallow toasting. The best spot is probably a drink on the veranda overlooking the picturesque Exe Valley – you can even see a vineyard! For children there is a small play area and box of garden games to really make the most of being outdoors. Adults also have the chance to get competitive on the boule court. 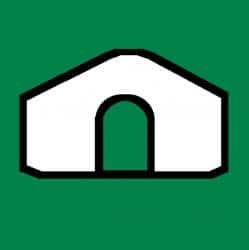 We welcome dogs, either one large or two small per tent, and we also provide dog bowls and treats. There is the Fisherman’s Cot pub on the river and Bickleigh Mill within a 5 minute walk and other restaurants and pubs a short drive away. There are many local attractions – next door is the Devon Railway Centre, and a short drive takes you to two national Trust properties, the Bear Trail, Diggerland, Crealy Adventure Park and a number of local breweries. Within an hour you can also reach both national parks and award-winning sandy beaches.